Apiaceae subfamily Saniculoideae comprises nine genera, with the African genera Steganotaenia and Polemanniopsis included within the new tribe Steganotaenieae C.I. Calviño & S.R. Downie and the remaining seven genera (Actinolema, Alepidea, Arctopus, Astrantia, Eryngium, Petagnaea, and Sanicula) included within an expanded and revised tribe Saniculeae. All genera are monophyletic (the genus Hacquetia is synonymized with Sanicula). Intergeneric relationships within subfamily Saniculoideae are fully resolved and generally very well supported. 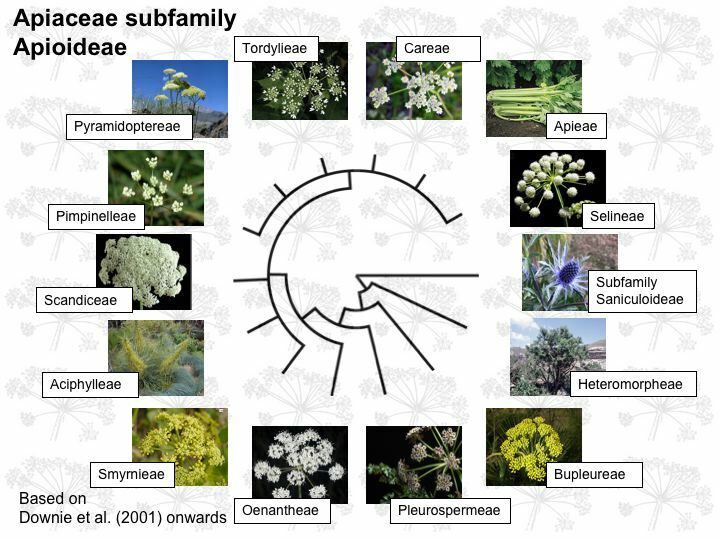 For more information, see Calviño and Downie (2007), Circumscription and phylogeny of Apiaceae subfamily Saniculoideae based on chloroplast DNA sequences, Molecular Phylogenetics and Evolution 44: 175-191. Apiaceae subfamily Apioideae comprises approximately 400 genera and 3000 species. Based on taxonomic congruence among the results of phylogenetic analyses of diverse molecular data sets (cpDNA gene and intron sequences, cpDNA restriction sites, and nrDNA ITS sequences), the following 10 tribes are erected or confirmed as monophyletic: Aciphylleae, Bupleureae, Careae, Coriandreae, Echinophoreae, Oenantheae, Pleurospermeae, Pyramidoptereae, Scandiceae (incl. subtribes Daucinae, Ferulinae, Scandicinae, Torilidinae, and the Glaucosciadium clade), and Smyrnieae. In addition, the results of previous and recent phylogenetic analyses of only ITS sequences support four monophyletic tribes (Apieae, Selineae [incl. Arracacia, Johrenia, and Perennial Endemic North American Apioid clades], Tordylieae [incl. Cymbocarpum and African peucedanoid clades], Pimpinelleae) and the following 12 informally recognized, major clades of largely uncertain relationship (asterisks denote clades that are monogeneric): Acronema, Arcuatopterus*, Cachrys, Chamaesium*, Conioselinum, Conium*, Diplolophium*, Erigenia*, Komarovia, Opopanax, Physospermopsis (East Asia clade), Sinodielsia. Several of these clades, however, are not well supported and intergrade in some phylogenetic analyses. Not all tribes, and none of the aforementioned major clades, are shown above in the Apioideae Tree of Life. For more information, see: Downie et al. 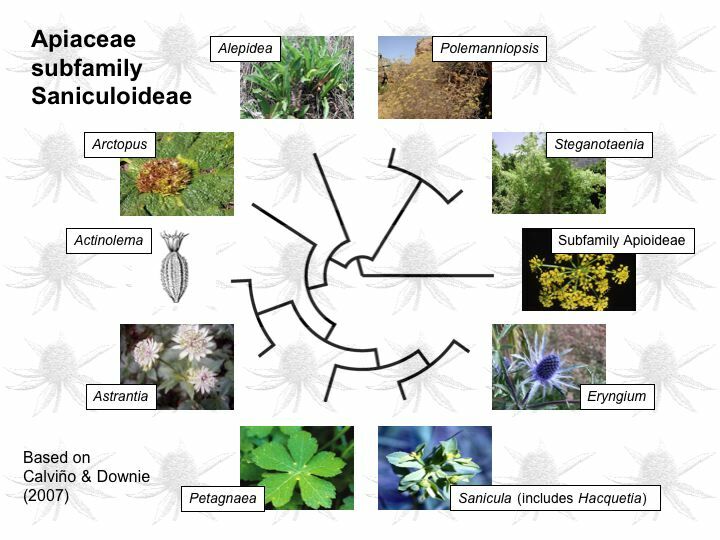 (2001), Tribes and clades within Apiaceae subfamily Apioideae: the contribution of molecular data, Edinburgh Journal of Botany 58: 301-330; Spalik et al. (2004), The phylogenetic position of Peucedanum sensu lato and allied genera and their placement in tribe Selineae (Apiaceae, subfamily Apioideae), Plant Systematics and Evolution 243: 189-210; Ajani et al. (2008), Phylogenetic analysis of nrDNA ITS sequences reveals relationships within five groups of Iranian Apiaceae subfamily Apioideae, Taxon 57: 383-401; Zhou et al. (2008), A molecular phylogeny of Chinese Apiaceae subfamily Apioideae inferred from nuclear ribosomal DNA internal transcribed spacer sequences, Taxon 57 (in press); and other recent papers cited under the link Publications.